Engeny in conjunction with City of Melton and ACLA Consultants were honoured to be nominated as a finalist for Stormwater Victoria’s Excellence in Infrastructure Award (2018) for the Ryans Creek Rehabilitation Project. 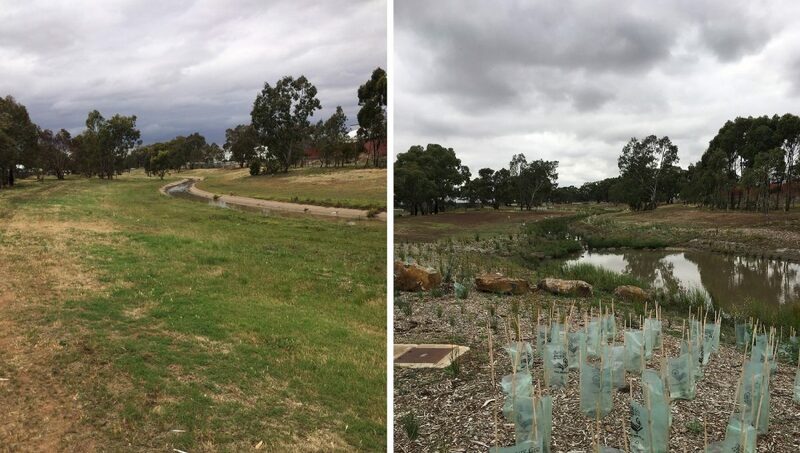 City of Melton engaged Engeny to undertake the detailed design of rehabilitation works for Ryans Creek in Melton. Ryans Creek previously consisted of a winding grassed floodway with a concrete lined channel. This project has transformed the waterway corridor to something genuinely aesthetically pleasing, whilst also achieving a range of benefits for City of Melton, Melbourne Water, the Melton Botanic Gardens, landowners and the Melton community including; maintaining flood capacity, providing for water harvesting for Melton Botanic Gardens, improving water quality, enhanced public open space and creation of habitat for frogs, birds and other animals. The project was also a finalist in the 2017 Keep Victoria Beautiful Sustainable Cities Awards in the clean beach / waterway category.